Welcome to the JCakes Order Form – Order Online! We are thrilled you have decided to place an order with JCakes. If you have special requests or custom needs, please note that in the Special Requests area and we will call you to clarify the design. Customized cakes and/or orders over $100.00 require a 50% deposit to reserve the date. Please give at least one week’s notice for your cake order. We will make every effort to accommodate last minute orders, however, so please do not hesitate to give us a call. All orders will be confirmed via email and, if any clarification is needed, we will call you. Read our FAQs for more info. 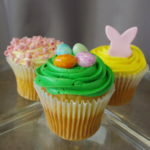 Check out our Easter Menu! Please be aware, JCakes will be CLOSED on Sunday, April 21st. Cakes for this date may be picked up the day before. We apologize for any inconvenience! Please give at least one week’s notice for your cake order. Our normal pickup hours are Wednesday through Friday 9am to 4pm, Saturday and Sunday 9am to 12 Noon. Please call us at 203.488.2800 for our Monday and Tuesday pickup hours. If you need a cake for a different day or time, we can arrange a pickup time on an individual basis. Join our mailing list to receive the latest news and specials from our team.